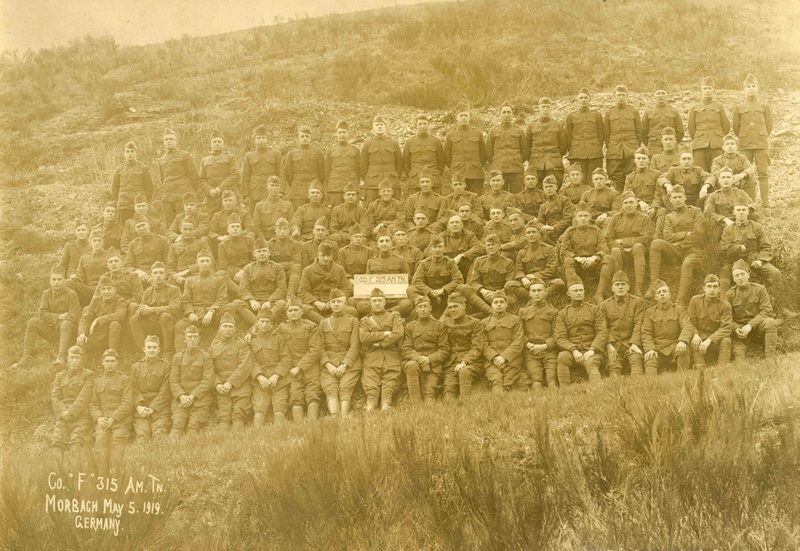 In honor of the 100 year anniversary of World War I, this online exhibit of local photographs and documents from the Clarke Museum's Collection depicts the men and women of Humboldt County that participated in the Great War. World War I lasted from 1914 to 1918, however the United States got involved in the war in 1917. The war was the Allies--Britain, France and Russia--against the Central Powers--Germany, Austria-Hungry, and Turkey--after the assassination of archduke Franz Ferdinand. The leaders of the war believed it would only last a few months, but after both sides dug extensive trenches the war quickly became a stalemate. Both sides used their alliances and colonies to add more and more people to the war, and by the end of the war in 1918 nine million people had died. This year marks the centennial of the start of World War I and these photographs are a reminder of various effects the war had on the community and people of Humboldt County. 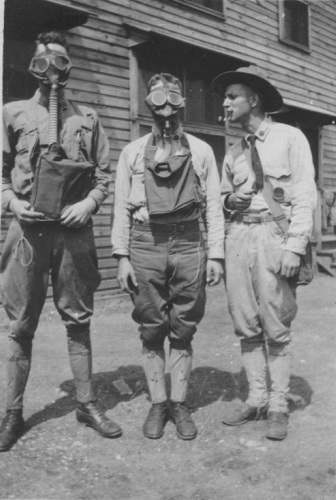 Three men standing in front of a wood building; two of the men are wearing gas masks. This accurately shows what the military issued for gas masks and what military men would wear. A soldier standing on what looks like a balcony. 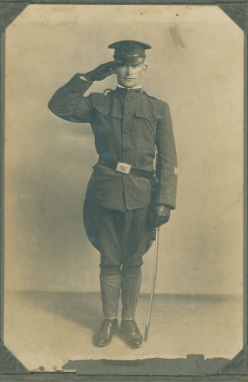 Unfortunately the name and rank of the man in the photo is unknown, however his rank is likely high based on the condition of his uniform, the strap going diagonally across his chest, and his style of hat. This photo shows the rear of a train with a crowd gathered near it. There are several heads sticking out of the train windows most likely saying their goodbyes to their loved ones. The writing on the photo says “Second Contingent of the first call in the Selective Draft leaving Eureka, Sept. 23, 1917.” Note a man in the crowd, to the left of the caboose, with the bowler hat on and crutches only has one leg; it is possible that this man either lost his leg during a lumber accident or he might have been in the war prior to this photo and had lost it then. A saluting soldier in uniform holding a sword. The man’s uniform seems to be made out of wool. The photo was obviously taken at a studio; the background is a plain white backdrop. This photo provides a good visual of what some of the uniforms would have looked like and what they were made of. The photo is contained in a brown folder that can actually stand upright. Was it possibly for a sweetheart? A couple sitting on their house front steps with a younger man, most likely their son. 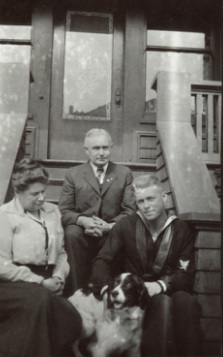 The young man is in a navy uniform and a dog can be seen standing near the young man. This is Charles and Cora Wright, however their son's name is not given. This could very possibly be a “going to war” photo or maybe he has just returned. A Navy unit with their captain. On the left top corner is a sign saying “Chaplain’s office.” The photo also contains five men's names that are written on the photo on the men's caps. A man two to the left of the captain seems to have visible tattoos on his wrists. These men are not as clean cut or neatly dressed as other photos in this collection; which suggests that they are either at a camp or this was not a planned photo. 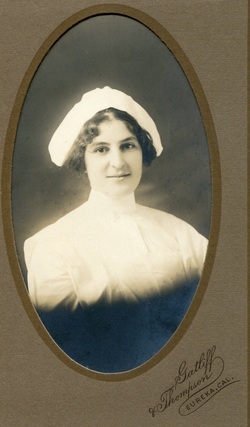 A dark-haired young nurse in uniform. Since this photo is just the waist high view of the nurse, we can not see her complete uniform. Like some of the other photographs, this photo was taken at a studio. A studio portrait of a smiling young woman who is wearing a white Red Cross uniform. This photo is still only from the waist up, however it shows what Red Cross nurses uniforms would look like during this time. A military group posed in front of a lumber mill in Blue Lake. The men in the photo make up the 5th Division Naval Militia. Note that not all the men are in naval uniform. Some of the men are in civilian clothing; which is understandable since it is a militia who are called upon when needed. There is also a small boy to the left and an older gentleman to the right of the group. The two men that are standing directly in front of the men seem to be commanders or captains. A photo of twenty-seven young men sitting on the ground/standing outside of an unpainted wood building. The men are wearing American WWI uniforms including hats that they are holding in their hands; a man standing up on the far right seems to be the officer. On the back of the photograph it identifies a man, 4th from the right in the front row, as George Dean. Twenty-eight men and five officers posing on the old courthouse steps. The men have rifles, while the officers have swords in hand. The men look very young, around 18 or 19 years old; however there are a few men in the company that seem to be a bit older than that, maybe early 20’s while the officers are much older. The picture was taken during a legal holiday as the sign behind them in the window says so, along with what is believed to say “Business Closed.” The exact date of this photo is unknown; between 1917-1918. 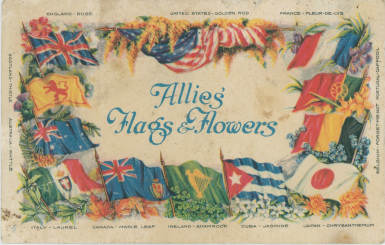 An unused postcard with colored drawings of national flags and flowers of the Allies. The text in the center states this and there are the names of each country and what flower is shown on the outer edge of the postcard. This card is obviously from the United States since the American flag is front and center and is the largest flag on the postcard. 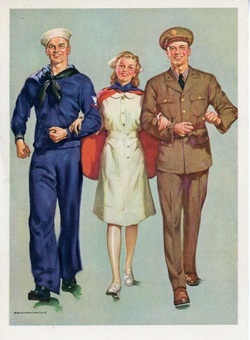 This is a cover painting of a sailor and a soldier flanking a nurse; the painting was done by “Harold Anderson.” All three of the of them seem to be happy to be in the military and serving their country, so it is safe to assume that it is propaganda in the form of a greeting card. 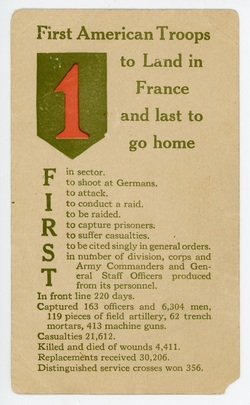 This is a postcard stating “First American Troops to land in France and last to go home.” This is possibly a souvenir for some of the troops time in France; the postcard gives a list of things the “First American Troops” did and also includes some statistics about the war. 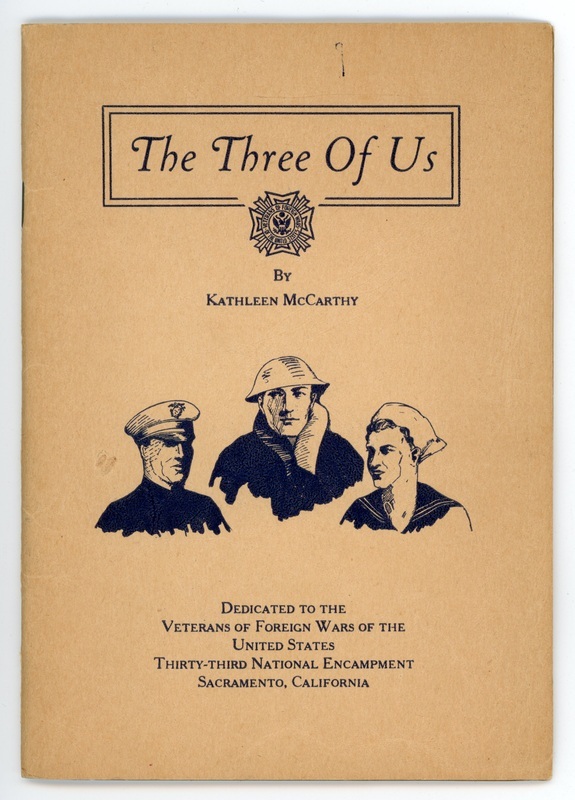 This is a small booklet full of poems by Kathleen McCarthy about WWI; on the front of the tan booklet are three drawings of soldiers. 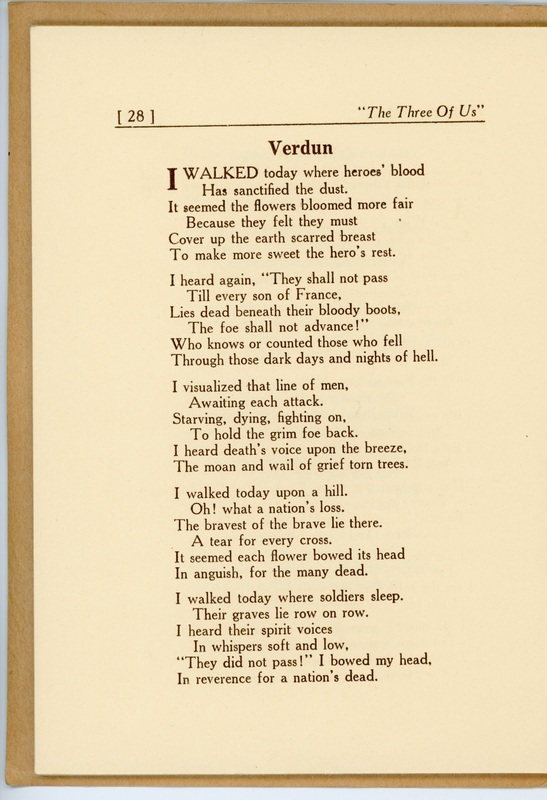 The booklet if titled “The Three Of Us.” There are some very interesting poems inside the booklet about different aspects of WWI, including a poem on Verdun on Page 28. 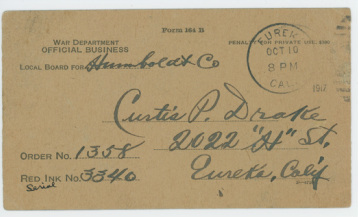 This is a tan draft card that is for a “Curtis P. Drake” in 1917. 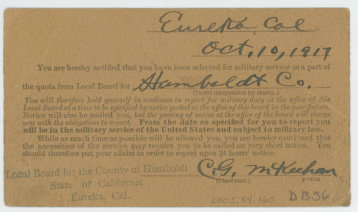 The card informs the receiver if he doesn’t report to military service by the time and date listed, he will be “subject to military law.” The Card is dated Oct. 10, 1917. 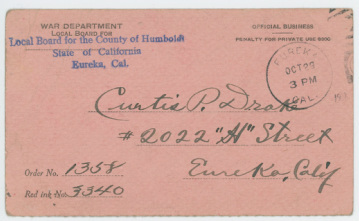 This is a pinkish draft card for “Curtis P. Drake” again and is stating where to go for enlistment and when to go. This card is similar to the previous one, however it seems to be more urgent or as if he did not report to the local board for Humboldt County. 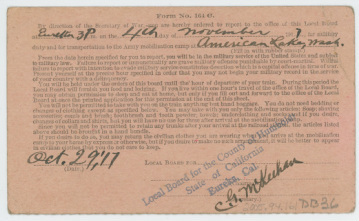 There is a lot more information on the back of the card about what would happen if one were to not show up for military service and what to bring on the train. It also includes what camp Mr. Drake was going to go to once on the train. A hard bound dairy from WWI owned by Alfred E. Beaumont in 1917. Mr. Beaumont is from Eureka and his diary dates from Sunday Nov. 25 1917-Thursday Oct. 17 1918. He narrates almost every day from the time he enlisted until he ran out of pages to write on. Each day he wrote about what he did, if anything interesting happened, and eventually he writes about what the weather is like where he is currently stationed. He gives a short description of his experience enlisting, getting vaccinated, where he was, if there were any deaths, and eventually news from the war front. He was stationed at several different camps in the United States and eventually he was stationed in France; however he never saw direct action and was the cook for his company. It is interesting to note that is looks like towards the end of this diary, his pens looks to be either running out of ink or he is simply writing faster.